TH E M R EP O RT | 47 SERVICING THE LATEST O R I G I NAT I O N S E R V I C I N G DATA G O V E R N M E N T S E C O N DA R Y M A R K E T CitiMortgage Stable Rating from Fitch It's ratings report notes improved audits, better internal controls, and low turnover as some of the influencing factors. A recent report brings good news for Citi- Mortgage, Inc. (CMI). The institution's U.S. Residential primary servicer rating for prime product and U.S. Resi - dential master servicer rating both received a 'RPS2+', Outlook Stable rating from Fitch Ratings. "The affirmation of the primary servicer rating and Stable Outlook reflect CMI's comprehensive inter - nal control environment, sustained improvement in audit results, and management and staffing turn- over," Fitch stated. According to the report, as of September 30, 2016, CMI was primary servicing over 1.5 million loans totaling $247.6 billion and master servicing more than 59,000 loans totaling $14.4 billion. The primary servicing portfolio is still declining through strategic asset sales of mortgage servicing rights (MSR) and whole loans. 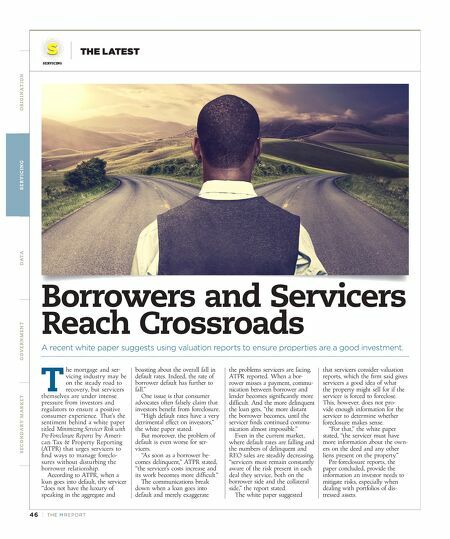 Additionally, the Fitch re - port said the primary servicing portfolio includes approximately 218,000 non-agency prime loans totaling $63.7 billion, while the master servicing portfolio includes legacy RMBS transactions as well as new master servicing assign - ments including several Redwood Trust issued Sequoia residential mortgage pass-thru certificates. "CMI has a strong institutional framework for compliance and control utilizing its 'three lines of defense' incorporating qual - ity assurance and quality control as the first line; independent control functions as the second line, and internal audit as the third line," the report stated. "Since Fitch's prior review, quality assurance transitioned to a risk based approach and continued its implementation of risk ratings for specific defects identified for each test." The Fitch report said that it is notable to mention CMI has sustained improvement in audit results with internal audit reports in the current review period con - taining a relatively low number of significant findings. Further, CMI's latest Reg AB re- port for the year ending December 31, 2015 contained no instances of material noncompliance for either the primary or master servicing operations, according to the re - port. However, in the prior review period, master servicing had a separately issued Reg AB report that contained two instances of material non-compliance. 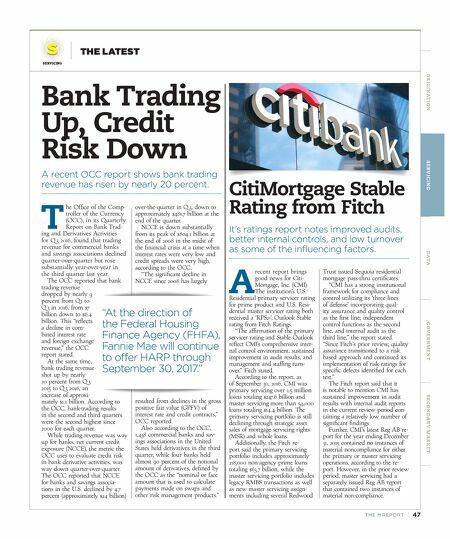 Bank Trading Up, Credit Risk Down A recent OCC report shows bank trading revenue has risen by nearly 20 percent. T he Office of the Comp- troller of the Currency (OCC), in its Quarterly Report on Bank Trad- ing and Derivatives Activities for Q 3 2016, found that trading revenue for commercial banks and savings associations declined quarter-over-quarter but rose substantially year-over-year in the third quarter last year. The OCC reported that bank trading revenue dropped by nearly 9 percent from Q2 to Q 3 in 2016, from $7 billion down to $6.4 billion. This "reflects a decline in com - bined interest rate and foreign exchange revenue," the OCC report stated. At the same time, bank trading revenue shot up by nearly 20 percent from Q 3 2015 to Q 3 2016, an increase of approxi - mately $1.1 billion. According to the OCC, bank-trading results in the second and third quarters were the second highest since 2000 for each quarter. While trading revenue was way up for banks, net current credit exposure (NCCE), the metric the OCC uses to evaluate credit risk in bank derivative activities, was way down quarter-over-quarter. The OCC reported that NCCE for banks and savings associa - tions in the U.S. declined by 4.7 percent (approximately $24 billion) over-the-quarter in Q 3, down to approximately $481.7 billion at the end of the quarter. NCCE is down substantially from its peak of $804.1 billion at the end of 2008 in the midst of the financial crisis at a time when interest rates were very low and credit spreads were very high, according to the OCC. "The significant decline in NCCE since 2008 has largely resulted from declines in the gross positive fair value (GPFV) of interest rate and credit contracts," OCC reported. Also according to the OCC, 1,438 commercial banks and sav - ings associations in the United States held derivatives in the third quarter, while four banks held almost 90 percent of the notional amount of derivatives, defined by the OCC as the "nominal or face amount that is used to calculate payments made on swaps and other risk management products." "At the direction of the Federal Housing Finance Agency (FHFA), Fannie Mae will continue to offer HARP through September 30, 2017."